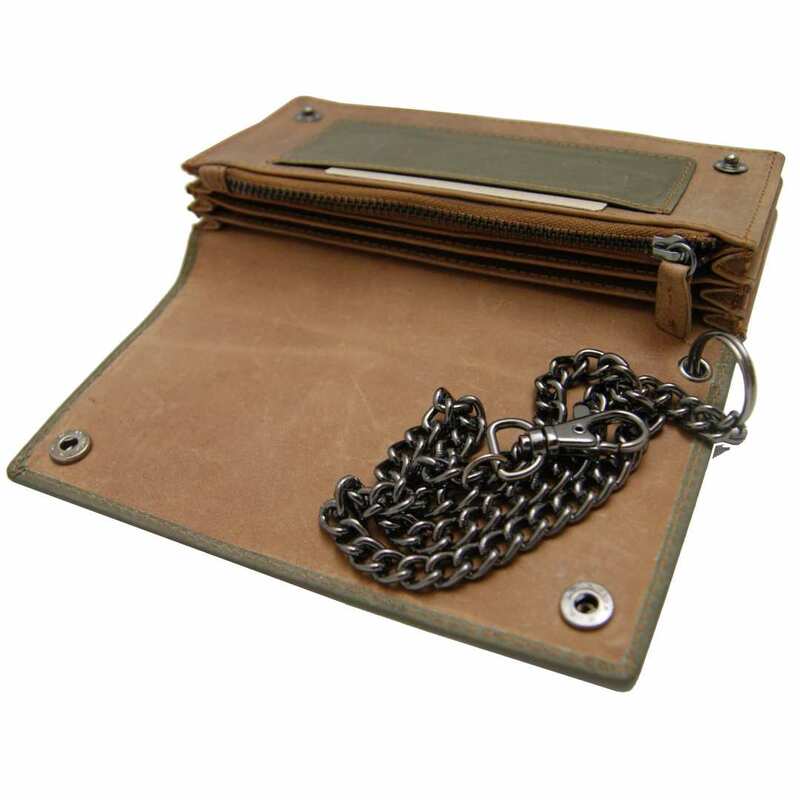 Product information "Long chain wallet BETTENCOURT of olive-brown leather"
Are you looking for an exclusive wallet that provides a beautiful appearance and a resistant texture as well as a high level of comfort? Then stop searching because you have hit the nail on the head! 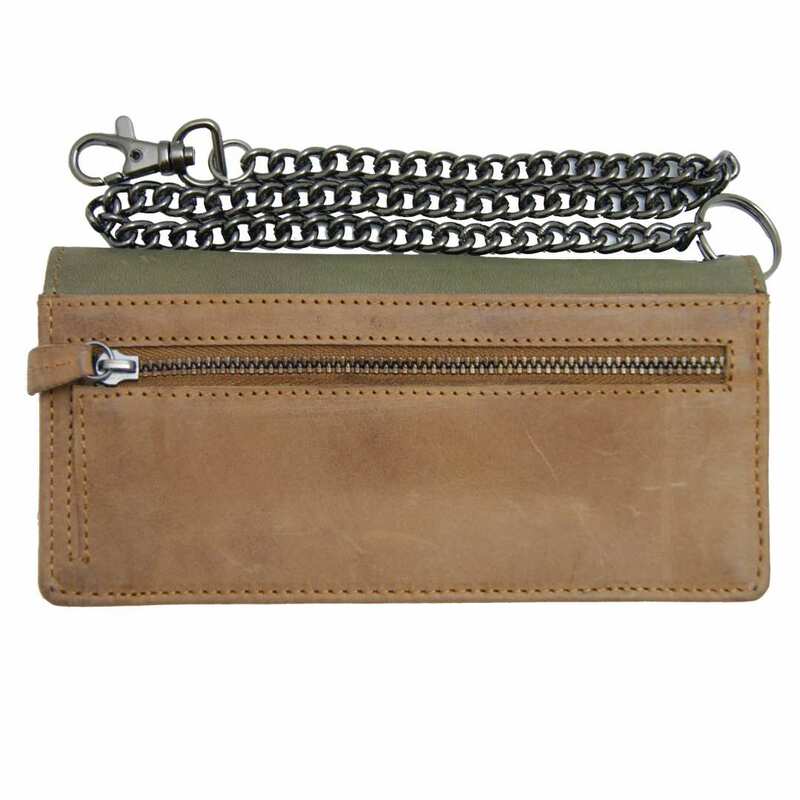 Discover the fantastic chain wallet BETTENCOURT made of olive-brown leather. The careful design of this leather accessoryenables you to store absolutely every necessary item in it and at the same time, to catch all glances thanks to its elegant and natural color combination. This is rounded up by the embossed crest of the noble designer BARON of MALTZAHN on the front side. Thanks to the various zippered compartments of this wallet, you can safely keep and transport bills, coins, credit and visit cards as well as some documents. To close the purse, just use the snap buttons on the front. Another advantage is the metal chain of this leather article. Thanks to this little helper, you can easily attach the purse to your trousers or skirt and not only enlarge the comfort, but also emphasize the rustic style of this fine accessory. The careful processing of this wallet held according to the traditional handicraft, makes of the BETTENCOURT a very particular leather article. The valuable material of the purse is very sturdy and resistant, weatherproof and durable. 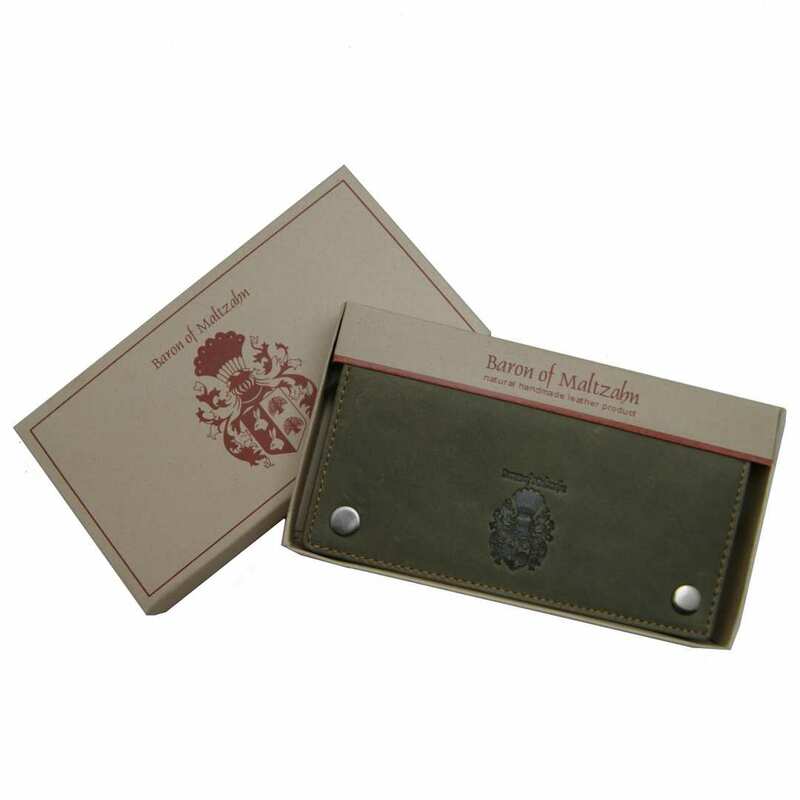 This nice leather wallet is delivered in a fancy gift box and is therefore perfect to give as a present. 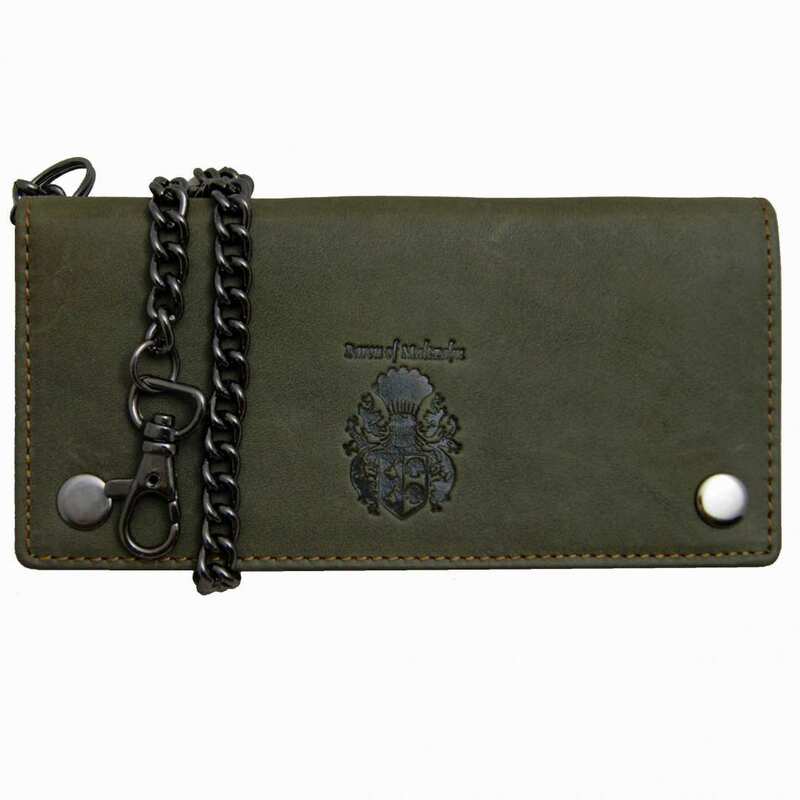 The total size of the leather wallet BETTENCOURT in olive and brown is 6.9 x 3.5 x 1 in (17.5x9x2.5 cm). Get convinced by the purse BETTENCOURT and order it now! Discover this fantastic piece of the fine Collection BARON of MALTZAHN. The wallet provides three bill compartments, one big pocket and another zippered one. On the back side, you will find one last zippered section for coins, etc. The material used for the chain is gun metal, which rounds up this nice leather accessory. 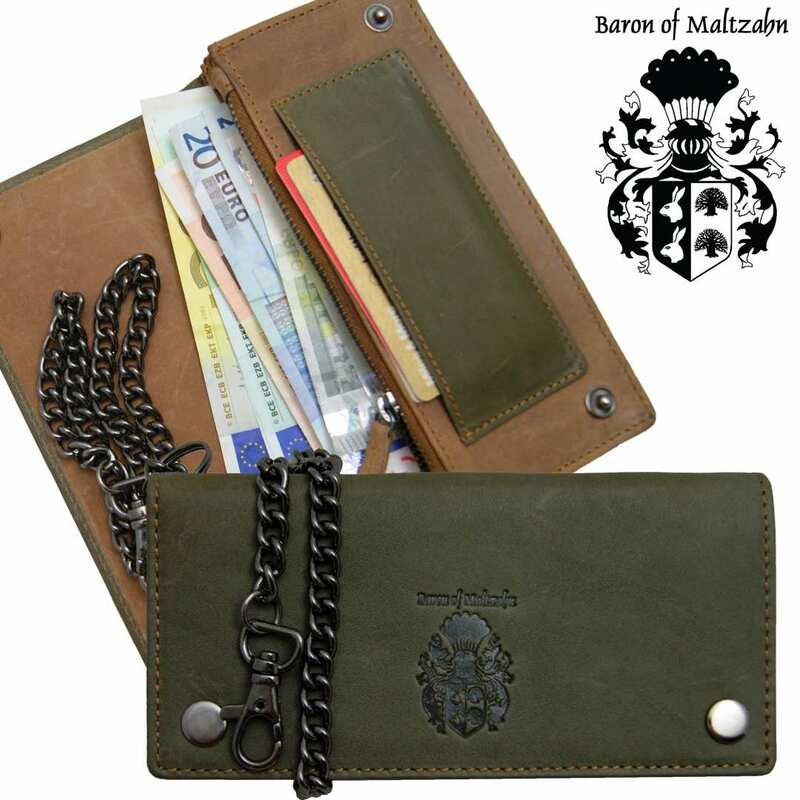 Do not wait any longer and order now this exclusive piece of the designer BARON of MALTZAHN! Reviews for "Long chain wallet BETTENCOURT of olive-brown leather"